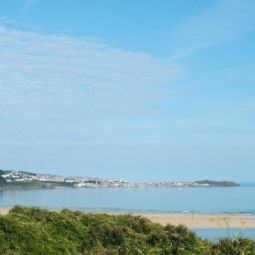 Self catering holiday chalets, bungalows and lodges at Hayle beach, St Ives Bay. With panoramic views of the bay and large open grass dunes. We also offer dog friendly properties. Toms Holidays is the only place to go for your Cornish holiday. Whatever your self catering requirements Toms Holidays can accommodate you. We have self catering beach accommodation, holiday chalets and bungalows available to book from April to October and over the Christmas period. With dog friendly properties, stunning views across St. Ives Bay and three miles of golden sand on our doorstep. Our peaceful forty acre site offers you the chance to unwind from the daily stress and take advantage of all that West Cornwall has to offer. By Car - Take the A30 trunk road via Exeter, Launceston to Hayle. Approaching Hayle there is a roundabout where you turn right to Hayle Town. At the double roundabout go straight on and turn right at the Recreation Ground via Phillack. Toms Holidays Office is approximately 1 mile away on the left. By Train - Most trains stop at either St. Erth or Hayle stations on the main Paddington / Penzance line. By Coach - There is a regular coach service from Victoria Coach Station to Penzance, which stops at Hayle.